Please listen to Ram dhun “SriRam JayaRam JayajayaRam” . Narada said: “Just now you have been discussing, you want to close your ihalila, that is the lila you have been enacting on this earth. But you should not go away simply like that. You should call a big assembly sabha – call everybody in Ayodhya and all of the world. Invite all the rishis and munis. Invite all the devas, yakshas, gandharvas. Invite everybody and announce your decision. Sri Rama agreed and duly a sabha was called. It was a big sabha – all were coming and lot of arrangements had to be done for that. So each one of Rama’s brothers was given duty. Sita was given duty of looking after the guests – all of them must be fed. So the kitchen was given to her. Like that, each one was given a responsibility. Shatrughna was to receive at the sabha, all the rishis and munis and give them chandana tilak and then give them a garland – a very good garland has to be put on their shoulders. And then give them proper seat asana – that was his duty. Everything was arranged on the appointed day. All have started coming. So Shatrughna thought a great rishi is telling. He simply took Durvasa, showed his seat and came away. And Durvasa sat and started meditating on Sri Rama. And when everything was alright, the right propitious time came, Sri Rama, Lakshmana, Bharata and Sita; all four entered. All the people got up to welcome Sri Rama. Only one person was sitting and that was Durvasa. Then Hanuman came and stood there – he saw his Master, standing on his chariot with bow and arrows. He left his mace gada and made pranams. Prabhu and bhakta both are now on the battlefield and the Master has to kill his devotee! All the gandharvas, yakshas, devatas and rishis and munis wondered at the scene that has been enacted there. Not able to get what he wanted, Sri Rama finally took one of his arrows and aimed at Hanuman. All prayed to Sri Rama: “Please do not use your Ram Baan. If Hanuman is killed will there be any devotee left? No more worshipping of God will be done – because God has killed his own bhakta; this is just not possible. So put down your astra.” Ram Baan – a term commonly used in India for anything that does not miss its target, because Ram Baan is always sure – it must aim and reach the target. And then Rama looked at Narada – was he behind all this drama? Prostrations at your holy feet. Thank you for this wonderful article. It is very much motivating for us in japa sadhana. May Sri Rama lead you “till your goal is reached” is my prayer! I am impressed with your site. 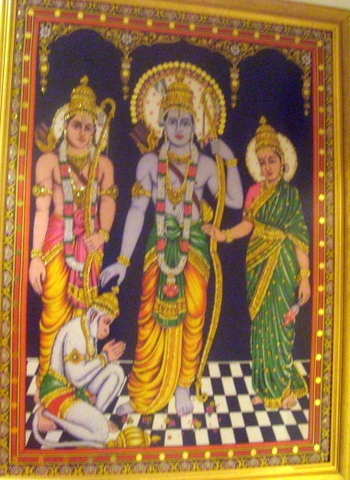 How do I download the Samskshipta Ramayanam? I am deeply impressed by the address delivered on Rama Navami Day. Indeed inspiring! Aha ! It was like a source of water to the person who is thirsty. Respected Maharaaj, a thousands Pronaam to you. Bless us so that we never forget this sweet name of Ram. Jai Ram, Sri Ram, Jai Sri Ram. This excellent article is an ideal drama piece. Whilst reading it stirs wonderful, heavenly emotions in one, Imagine when it is acted out by the youth, what a profound effect it will have on the congregation! Yes! the power of faith and love will be further enhanced in His devotees. We are grateful to read this wonderful article on Lord Hanuman – the gratest DEVOTEE! We will be eagerly waiting for such articles. Thank you for such a wonderful article….on the Lord and his Name. Prostrations at your Lotus Feet. Thank you for looking at our website. I just saw your reply to my comment. Thank you swamiji for your time. It is a small effort from our side. The Samkshipta Ramayanam of Adi Kavi Valmiki is in Telugu font. I am sending you the link in this message. It may take a while for it to load. But it will definitely open in the window. I can convert the original font into sanskrit and i can you send that also if you would prefer sanskrit. We often visit Sri Ramakrishna Math in Chicago, USA, and also try to attend retreats in Vedanta Monastery at Ganges, Michigan. We have learnt three upanishads under Pujya Swami Brahmarupananda ji Maharaj of Washington branch in these retreats. We were very fortunate to have met Pujya Swami Sridharananda ji Maharaj. It was Ramakrishna Mission at Bangalore (Bull temple road), that sowed the seed in my heart. And I learnt wonderful prayers and Bhajans there. As per that, my husband and I do Ram Nam Sankirtan every saturday at our house, with this wonderful experience. Thank you Swamiji Maharaj, for your time and kindness. Please tell me any little use I can be of. I use a very good Phoneme System to type in Indic Scripts. I started typing in Bhajans of Ramakrishna Ashram, and planning to upload that. It does inter-translation to all Indian Languages. If I can be of any little use in your work, I will be very fortunate. Thank you. The new picture used for Sri Rama and His Sweet Name is really beautiful. The picture comes ALIVE, when the article is read!!! The Majestic pose of Sri Ram and the Humble Prostrations of Hanumaji is really mesmerising!! HANUMANJI’S LOVE FOR SRI RAM IS TRUE AND ETERNAL, The picture says it all. Revered Swamiji, Pranams at your Lotus feet. Thank you Swamiji for this wonderful portion on the Lord’s glory. We study Law become Lawyer..medicine and become Doctor. Reading this we would become TRUE DEVOTEES of Shri RAMA. Thank you Swamiji. Lots of love. Sri Rama and His Sweet Name touched the heart and brought a hope of ray in our sufferings and misery. aap ko raamnaam ki madhurtaa ka swaad aagaya hai. yah maanav jeevan ki utkristata hai. raam naam jisko bhagya vo chaaro padaarath pa gaya. dhany ho aap or aap ke pariwar wale! Can u post audio of “Sri Ram Jaya Ram Jaya jaya Ram”chanting for download? Yes, Saison, I have posted the audio “Sri Ram Jaya Ram Jaya jaya Ram” chanting for download here. May Sri Ram bless you! Una vez mas no tengo palabras para agradecer su trabajo continuo, cada nota es una perla para atesorar en nuestro corazón. Pronam ! Once again I have no words to thank you for your continued work, each note is a gem to treasure in our hearts. Pronam! Indeed I am thankful to you for your appreciative words! I was interested to see your blog too but the provided link says “Nothing Found”!